A bonus day today – 29th February – added back in Roman times to get us back in sync with the astronomical year, to get us back on track. I remember in my secondary school days when there was that thrilling yet terrifying prospect of a day when girls could propose to boys. Such ridiculous excitement. Queen Margaret of Scotland (in the 1400s) is recorded to have brought in a law with hefty fines for any man who turned down a woman’s proposal. I’m sure there was much glove-wearing at the time. Anyway, tomorrow is March and March is definitely spring. Spring, not winter. So, with a spring in my step I picked this (rather obvious, though it is) selection of perfect tiny spring blooms from the garden this morning. Tete-a-tete daffs, primroses, grape hyacinths, snowdrops and a solitary purple geranium. The sight of these petite blooms fills me with delight and optimism for the growing season ahead. I’m off to the garden centre later to buy seeds; there are garden vouchers burning a hole in my pocket. I have visions of clouds of cosmos, drifts of Californian poppies studded with a dark blue/purple something or other, and borage and calendula around the veg plot. I’m joining in again with Cathy at Rambling in the Garden and all the lovely Monday vases. Thank you for hosting such a joyful gathering Cathy. I liked the way you laid all your blooms out and photographed them before putting them in the vases – perhaps in the ame way that ingredients might be laid out and photographed in the cookery books you edit! 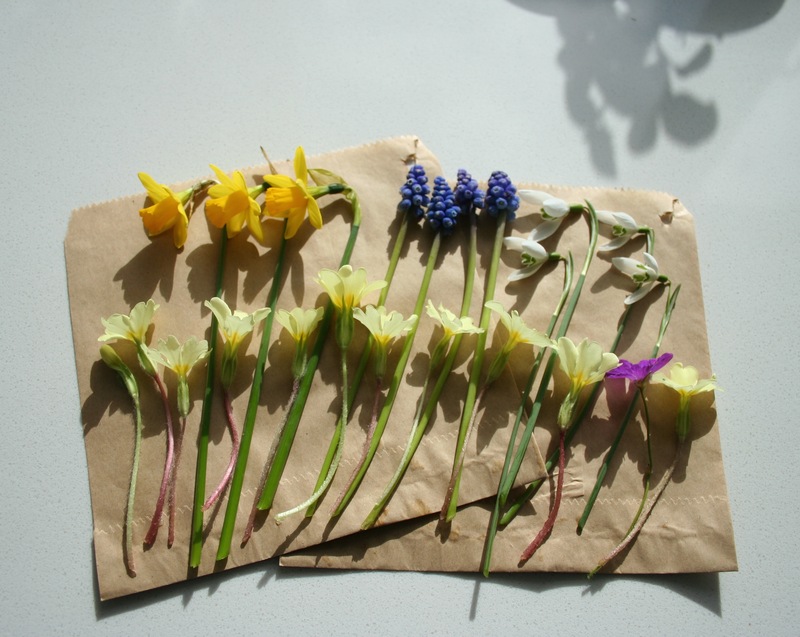 I shall be adding a few little posies like yours during the week and popping them lsewhere in the house while I still have them – so thanks for sharing yours and reminding us how pretty even an ‘obvious’ selection of blooms is. And for the bonus of info on the 29th Feb – I wonder if Queen M was married…? The primroses are still looking great, four days on. I think Queen M was married to a King James of Scotland, possibly III. Having been at primary school in Scotland the only history we learned was Scottish so I am sure I would have known that once – but it is rather a long time ago!! I like the flowers laid out ready to be used almost as much as the pretty vases, what a clever idea. I enjoy celebrating the season we’re in so your ‘obvious’ choice is perfect. The palest yellow primroses are the prettiest I think. The brighter ones are cheery but I prefer these too. I’ve always been envious that you all get such dear little blooms so early – even with our unseasonably warm winter it will be several weeks before we see any crocus opening up.Thank you for the very cheering photos! I also loved how you laid out these lovely spring blooms…and enjoyed the bit of history! The very image of spring, simple and not at all sophisticated, just the way it is in our gardens. Great idea – those flowers laid out to be used, may I ”steal” it? I think the grape hyacinths here have benefitted from all the earth-moving that has occurred over the past couple of years as we have loads popping up. I was very restrained at the garden centre (they didn’t have many of the seeds I wanted) but did enjoy perusing their plants. These are small but perfectly formed posies. I think primroses are my favourite Spring flower, but mine aren’t flowering yet. You’ve made me think I should swing by the garden centre too and choose some new flower seeds for this year. I think we must be slightly milder here (although it’s hard to believe as it’s cold, cold today) – there are primroses coming out all along the clifftops too. This is the time of year to be glad you have a selection of miniature jugs and bottles. One of my favourites is a tiny fish paste glass jar. There must have been barely enough in it to fill one sandwich. Your primroses are enviably perfect. Mine are rather mud spotted and ragged. I collect potential ‘vases’ much to my husband’s annoyance. 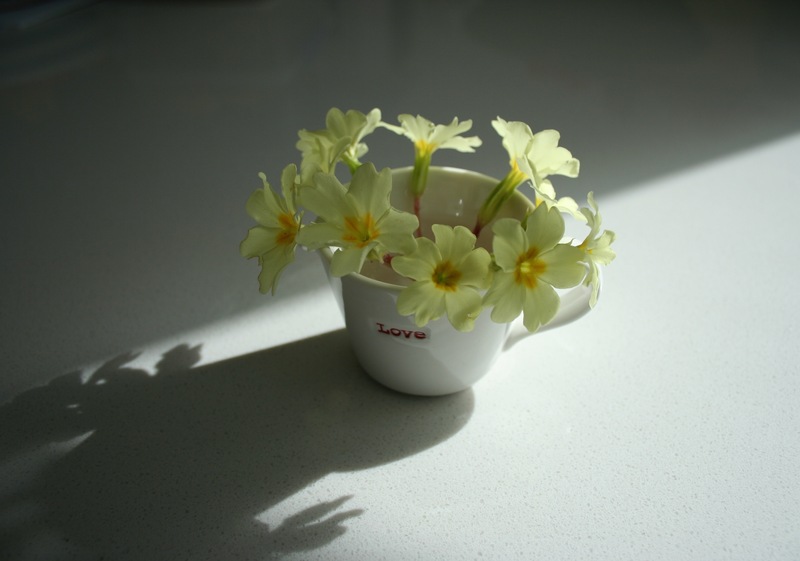 I like the primroses in the love cup, very appropriate with the leap year. What difference did the glove wearing make? I’m guessing that men would have made sure they were wearing gloves to hide the absence of a wedding ring! Of course, I should of thought of that. Very sweet, and as you say, with all the hope and promise of more to come in the summer. Gorgeous, gorgeous, gorgeous and Allelujia for Spring! Seasonal flowers indoors never fail to lift my spirits. I couldn’t find borage, so I ordered it online. In fact, I ended up ordering rather a lot online. I always overestimate the time and space available! 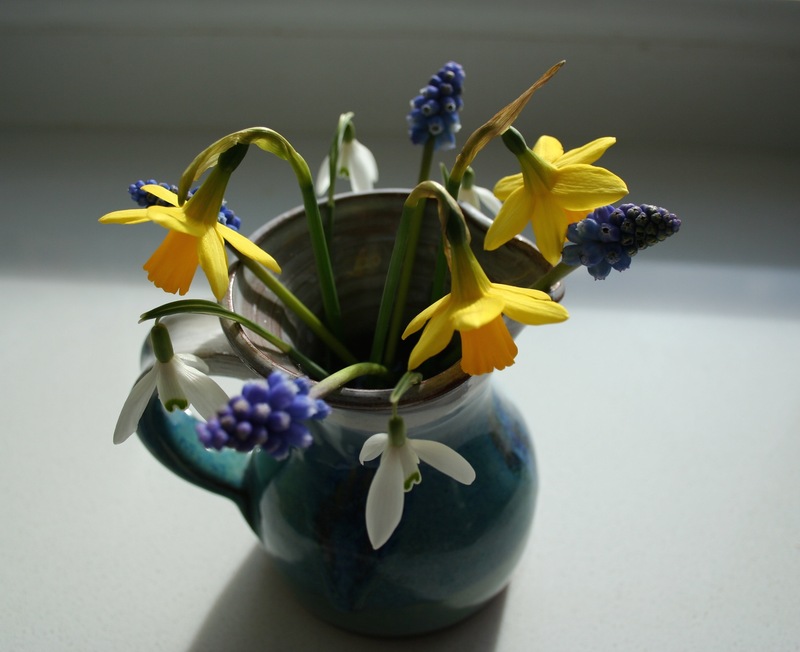 Petite Narcissi and blue Muscari – really lovely! I’m waiting to see the Muscari I planted last fall come up and bloom, but will likely have to wait until May. Gosh, May? Ours are popping up all over the place here. It must be the ‘mild’ sea air. Hello Bec, it’s that time of year – seed-sowing – yay!